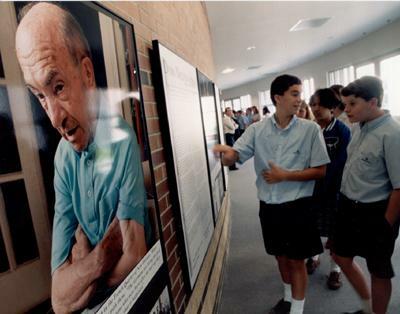 Holocaust Survivors: Photo Gallery - "High School Students View the Exhibit"
Students at the Holocaust Surviviors: Portraits and Conversations Exhibit view a portrait of Jack Berman, a native of Radom, Poland and survivor of many slave labor camps. Photo Credit: The Times-Picayune Publishing Corporation. All rights reserved. Reprinted with permission.